With each passing week, sweaters become gauzier, tights become optional--and sandals are no longer a souvenir from the warmer months but a viable footwear option to flirt with. As we trade in our ankle booties for minimal mules, pedicures suddenly make a comeback, taking priority in springtime beauty routines. For those who emerge from winter with a vampirical pallor or find themselves simply unready for summertime brights, selecting the perfect shade for your pedicure's seasonal debut requires some strategy. To aid in the decision-making process, we asked five experts to weigh in with their recommendations for the most universally flattering shades. "The single most flattering shade for the first day of sandal season is coral--it announces the arrival of spring and looks fresh and feminine on all skin tones." "We have been loving light blue on everyone lately! It can come across warm or cool. Our current favorite is CND Creekside." "I like Chanel's Camélia. It's hot pink and will be pretty [on everyone]! Also a light blue color from Essie called Bikini So Teeny--it's very spring-y and different." "My favorite universal pedicure colors are shades between periwinkle and lavender. It feels fun and unexpected but has a neutral softness to it, which doesn't draw so much attention to toes that haven't seen the light of day in a few months. Since periwinkle blue is so far away on the spectrum of color from any skin tone, it's going to pop off everyone and have a nice defining contrast." "I've seen people try every shade possible: While nudes are nice, they seem bleak on some feet, and while [bordeaux] can be elegant, it looks drab on certain skin tones. 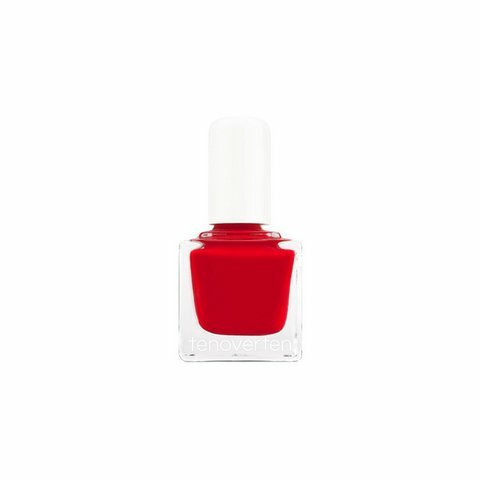 You can't beat a coral red such as Tenoverten's Ludlow or NARS in Dovima for the perfect color as we enter this sandal season."